Looking back through Western history, it’s incredible to see how many types of art have made an impact on society. By tracing a timeline through different art movements, we’re able to not only see how modern and contemporary art has developed, but also how art is a reflection of its time. For instance, did you know that Impressionism was once considered an underground, controversial movement or that Abstract Expressionism signaled a shift in the art world from Paris to New York? 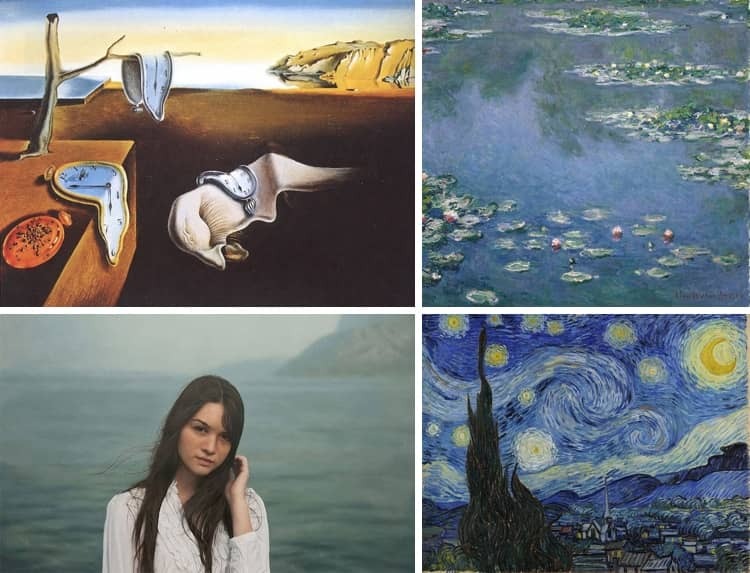 Like building blocks, from Realism to Lowbrow, these different types of art are interconnected. As the creative pendulum swings, artistic styles are often reactions against or homages to their predecessors. And by looking back at some of the most important art movements in history, we have a clearer understanding of how famous artists like Van Gogh, Picasso, and Warhol have revolutionized the art world. These 10 visual art movements are fundamental to understanding the different types of art that shape modern history. Realism is a genre of art that started in France after the French Revolution of 1848. A clear rejection of Romanticism, the dominant style that had come before it, Realist painters focused on scenes of contemporary people and daily life. What may seem normal now was revolutionary after centuries of painters depicting exotic scenes from mythology and the Bible, or creating portraits of the nobility and clergy. French artists like Gustave Courbet and Honoré Daumier, as well as international artists like James Abbott McNeill Whistler, focused on all social classes in their artwork, giving voice to poorer members of society for the first time and depicting social issues stemming from the Industrial Revolution. Photography was also an influence on this type of art, pushing painters to produce realistic representations in competition with this new technology. It may be hard to believe, but this now beloved art genre was once an outcast visual movement. Breaking from Realism, Impressionist painters moved away from realistic representations to use visible brushstrokes, vivid colors with little mixing, and open compositions to capture the emotion of light and movement. The Impressionists started as a group of French artists who broke with academic tradition by painting en plein air—a shocking decision when most landscape painters executed their work indoors in a studio. The original group, which included Claude Monet, Pierre-Auguste Renoir, Alfred Sisley, and Frédéric Bazille, formed in the early 1860s in France. Additional artists would join in forming their own society to exhibit their artwork after being rejected by the traditional French salons, who deemed it too controversial to exhibit. This initial underground exhibition, which took place in 1874, allowed them to gain public favor. Learn more about Claude Monet’s most famous paintings. Again originating from France, this type of art developed between 1886 and 1905 as a response to the Impressionist movement. This time, artists reacted against the need for the naturalistic depictions of light and color in Impressionist art. As opposed to earlier styles, Post-Impressionism covers many different types of art, from the Pointillism of Georges Seurat to the Symbolism of Paul Gauguin. Not unified by a single style, artists were united by the inclusion of abstract elements and symbolic content in their artwork. Perhaps the most well-known Post-Impressionist is Vincent Van Gogh, who used color and his brushstrokes not to convey the emotional qualities of the landscape, but his own emotions and state of mind. Learn more about the pioneers of Post-Impressionism. A truly revolutionary style of art, Cubism is one of the most important art movements of the 20th century. Pablo Picasso and Georges Braque developed Cubism in the early 1900s, with the term being coined by art critic Louis Vauxcelles in 1907 to describe the artists. Throughout the 1910s and 1920s, the two men—joined by other artists—would use geometric forms to build up the final representation. Completely breaking with any previous art movement, objects were analyzed and broken apart, only to be reassembled into an abstracted form. This reduction of images to minimal lines and shapes was part of the Cubist quest for simplification. The minimalist outlook also trickled down into the color palette, with Cubists forgoing shadowing and using limited hues for a flattened appearance. This was a clear break from the use of perspective, which has been the standard since the Renaissance. Cubism opened the doors for later art movements, like Surrealism and Abstract Expressionism, by throwing out the prescribed artist’s rulebook. Learn more about Picasso’s self-portraits. “The Persistence of Memory” by Salvador Dalí. 1931. MoMA, New York. A precise definition of Surrealism can be difficult to grasp, but it’s clear that this once avant-garde movement has staying power, remaining one of the most approachable art genres, even today. Imaginative imagery spurred by the subconscious is a hallmark of this type of art, which started in the 1920s. The movement began when a group of visual artists adopted automatism, a technique that relied on the subconscious for creativity. Tapping into the appeal for artists to liberate themselves from restriction and take on total creative freedom, Surrealists often challenged perceptions and reality in their artwork. Part of this came from the juxtaposition of a realistic painting style with unconventional, and unrealistic, subject matters. The post 10 Revolutionary Art Movements That Have Shaped Our Visual History appeared first on My Modern Met.